In futures studies and the history of technology, accelerating change is a perceived increase in the rate of technological change throughout history, which may suggest faster and more profound change in the future and may or may not be accompanied by equally profound social and cultural change. In 1910 during the town planning conference of London Daniel Burnham noted that "But it is not merely in the number of facts or sorts of knowledge that progress lies: it is still more in the geometric ratio of sophistication, in the geometric widening of the sphere of knowledge, which every year is taking in a larger percentage of people as time goes on." and later on "It is the argument with which I began, that a mighty change having come about in fifty years, and our pace of development having immensely accelerated, our sons and grandsons are going to demand and get results that would stagger us." In 1938, Buckminster Fuller introduced the word ephemeralization to describe the trends of "doing more with less" in chemistry, health and other areas of industrial development. In 1946, Fuller published a chart of the discoveries of the chemical elements over time to highlight the development of accelerating acceleration in human knowledge acquisition. In a series of published articles from 1974–1979, and then in his 1988 book Mind Children, computer scientist and futurist Hans Moravec generalizes Moore's law to make predictions about the future of artificial life. Moore's law describes an exponential growth pattern in the complexity of integrated semiconductor circuits. Moravec extends this to include technologies from long before the integrated circuit to future forms of technology. Moravec outlines a timeline and a scenario in which robots will evolve into a new series of artificial species, starting around 2030–2040. In Robot: Mere Machine to Transcendent Mind, published in 1998, Moravec further considers the implications of evolving robot intelligence, generalizing Moore's Law to technologies predating the integrated circuit, and also plotting the exponentially increasing computational power of the brains of animals in evolutionary history. Extrapolating these trends, he speculates about a coming "mind fire" of rapidly expanding superintelligence similar to the explosion of intelligence predicted by Vinge. In his TV series Connections (1978)—and sequels Connections² (1994) and Connections³ (1997)—James Burke explores an "Alternative View of Change" (the subtitle of the series) that rejects the conventional linear and teleological view of historical progress. Burke contends that one cannot consider the development of any particular piece of the modern world in isolation. Rather, the entire gestalt of the modern world is the result of a web of interconnected events, each one consisting of a person or group acting for reasons of their own motivations (e.g., profit, curiosity, religious) with no concept of the final, modern result to which the actions of either them or their contemporaries would lead. The interplay of the results of these isolated events is what drives history and innovation, and is also the main focus of the series and its sequels. Burke also explores three corollaries to his initial thesis. The first is that, if history is driven by individuals who act only on what they know at the time, and not because of any idea as to where their actions will eventually lead, then predicting the future course of technological progress is merely conjecture. Therefore, if we are astonished by the connections Burke is able to weave among past events, then we will be equally surprised to what the events of today eventually will lead, especially events we weren't even aware of at the time. The second and third corollaries are explored most in the introductory and concluding episodes, and they represent the downside of an interconnected history. If history progresses because of the synergistic interaction of past events and innovations, then as history does progress, the number of these events and innovations increases. This increase in possible connections causes the process of innovation to not only continue, but to accelerate. Burke poses the question of what happens when this rate of innovation, or more importantly change itself, becomes too much for the average person to handle, and what this means for individual power, liberty, and privacy. The mindsteps... appear to have certain things in common - a new and unfolding human perspective, related inventions in the area of memes and communications, and a long formulative waiting period before the next mindstep comes along. None of the mindsteps can be said to have been truly anticipated, and most were resisted at the early stages. In looking to the future we may equally be caught unawares. We may have to grapple with the presently inconceivable, with mind-stretching discoveries and concepts. The mathematician Vernor Vinge popularized his ideas about exponentially accelerating technological change in the science fiction novel Marooned in Realtime (1986), set in a world of rapidly accelerating progress leading to the emergence of more and more sophisticated technologies separated by shorter and shorter time intervals, until a point beyond human comprehension is reached. His subsequent Hugo award-winning novel A Fire Upon the Deep (1992) starts with an imaginative description of the evolution of a superintelligence passing through exponentially accelerating developmental stages ending in a transcendent, almost omnipotent power unfathomable by mere humans. His already mentioned influential 1993 paper on the technological singularity compactly summarizes the basic ideas. An analysis of the history of technology shows that technological change is exponential, contrary to the common-sense 'intuitive linear' view. So we won't experience 100 years of progress in the 21st century—it will be more like 20,000 years of progress (at today's rate). The 'returns,' such as chip speed and cost-effectiveness, also increase exponentially. There's even exponential growth in the rate of exponential growth. Within a few decades, machine intelligence will surpass human intelligence, leading to the Singularity—technological change so rapid and profound it represents a rupture in the fabric of human history. The implications include the merger of biological and nonbiological intelligence, immortal software-based humans, and ultra-high levels of intelligence that expand outward in the universe at the speed of light. 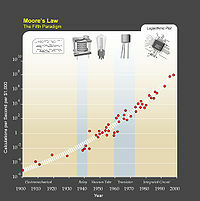 An updated version of Moore's Law over 120 Years (based on Kurzweil's graph). The 7 most recent data points are all NVIDIA GPUs. The Law of Accelerating Returns has in many ways altered public perception of Moore's law. It is a common (but mistaken) belief that Moore's law makes predictions regarding all forms of technology, when really it only concerns semiconductor circuits. 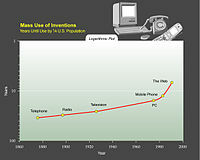 Many futurists still use the term "Moore's law" to describe ideas like those put forth by Moravec, Kurzweil and others. According to Kurzweil, since the beginning of evolution, more complex life forms have been evolving exponentially faster, with shorter and shorter intervals between the emergence of radically new life forms, such as human beings, who have the capacity to engineer (i.e. intentionally design with efficiency) a new trait which replaces relatively blind evolutionary mechanisms of selection for efficiency. By extension, the rate of technical progress amongst humans has also been exponentially increasing, as we discover more effective ways to do things, we also discover more effective ways to learn, i.e. language, numbers, written language, philosophy, scientific method, instruments of observation, tallying devices, mechanical calculators, computers, each of these major advances in our ability to account for information occur increasingly close together. Already within the past sixty years, life in the industrialized world has changed almost beyond recognition except for living memories from the first half of the 20th century. This pattern will culminate in unimaginable technological progress in the 21st century, leading to a singularity. Kurzweil elaborates on his views in his books The Age of Spiritual Machines and The Singularity Is Near. Accelerating change may not be restricted to the Anthropocene Epoch, but a general and predictable developmental feature of the universe. The physical processes that generate an acceleration such as Moore's law are positive feedback loops giving rise to exponential or superexponential technological change. These dynamics lead to increasingly efficient and dense configurations of Space, Time, Energy, and Matter (STEM efficiency and density, or STEM "compression"). At the physical limit, this developmental process of accelerating change leads to black hole density organizations, a conclusion also reached by studies of the ultimate physical limits of computation in the universe. Applying this vision to the search for extraterrestrial intelligence leads to the idea that advanced intelligent life reconfigures itself into a black hole. Such advanced life forms would be interested in inner space, rather than outer space and interstellar expansion. They would thus in some way transcend reality, not be observable and it would be a solution to Fermi's paradox called the "transcension hypothesis", Another solution is that the black holes we observe could actually be interpreted as intelligent super-civilizations feeding on stars, or "stellivores". This dynamics of evolution and development is an invitation to study the universe itself as evolving, developing. If the universe is a kind of superorganism, it may possibly tend to reproduce, naturally or artificially, with intelligent life playing a role. Examples of large human "buy-ins" into technology include the computer revolution, as well as massive government projects like the Manhattan Project and the Human Genome Project. The foundation organizing the Methuselah Mouse Prize believes aging research could be the subject of such a massive project if substantial progress is made in slowing or reversing cellular aging in mice. Both Theodore Modis and Jonathan Huebner have argued—each from different perspectives—that the rate of technological innovation has not only ceased to rise, but is actually now declining. In fact, "technological singularity" is just one of a few singularities detected through the analysis of a number of characteristics of the World System development, for example, with respect to the world population, world GDP, and some other economic indices. It has been shown that the hyperbolic pattern of the world demographic, economic, cultural, urbanistic, and technological growth (observed for many centuries, if not millennia prior to the 1970s) could be accounted for by a rather simple mechanism, the nonlinear second-order positive feedback, that was shown long ago to generate precisely the hyperbolic growth, known also as the "blow-up regime" (implying just finite-time singularities). In our case this nonlinear second order positive feedback looks as follows: more people – more potential inventors – faster technological growth – the carrying capacity of the Earth grows faster – faster population growth – more people – more potential inventors – faster technological growth, and so on. On the other hand, this research has shown that since the 1970s the World System does not develop hyperbolically any more, its development diverges more and more from the blow-up regime, and at present it is moving "from singularity", rather than "toward singularity". Jürgen Schmidhuber calls the Singularity "Omega", referring to Teilhard de Chardin's Omega Point (1916). For Omega = 2040, he says the series Omega - 2n human lifetimes (n < 10; one lifetime = 80 years) roughly matches the most important events in human history. Kurzweil created the following graphs to illustrate his beliefs concerning and his justification for his Law of Accelerating Returns. ^ Town Planning Conference (1910 : London, England); Royal Institute of British Architects (8 July 2018). Transactions. London : Royal Institute of British Architects – via Internet Archive. ^ R. Buckminster Fuller, Nine Chains to the Moon, Southern Illinois University Press  1963 pp. 276–79. ^ Ulam, Stanislaw (May 1958). "Tribute to John von Neumann". 64, nr 3, part 2. Bulletin of the American Mathematical Society: 5. ^ Moravec, Hans (1998). "When will computer hardware match the human brain?". Journal of Evolution and Technology. 1. Archived from the original on 15 June 2006. Retrieved 2006-06-23. ^ Moravec, Hans (June 1993). "The Age of Robots". Archived from the original on 15 June 2006. Retrieved 2006-06-23. ^ Moravec, Hans (April 2004). "Robot Predictions Evolution". Archived from the original on 16 June 2006. Retrieved 2006-06-23. ^ The Law of Accelerating Returns. Ray Kurzweil, March 7, 2001. ^ Steffen, Will; Broadgate, Wendy; Deutsch, Lisa; Gaffney, Owen; Ludwig, Cornelia (2015). "The trajectory of the Anthropocene: The Great Acceleration". The Anthropocene Review. 2: 81–98. doi:10.1177/2053019614564785. ^ Nagy, Béla; Farmer, J. Doyne; Trancik, Jessika E.; Gonzales, John Paul (October 2011). "Superexponential Long-Term Trends in Information Technology" (PDF). Technological Forecasting and Social Change. 78 (8): 1356–1364. doi:10.1016/j.techfore.2011.07.006. hdl:1721.1/105411. ISSN 0040-1625. Retrieved 2013-07-09. ^ a b Smart, J. M. (2012). "The Transcension Hypothesis: Sufficiently advanced civilizations invariably leave our universe, and implications for METI and SETI". Acta Astronautica. 78: 55–68. Bibcode:2012AcAau..78...55S. CiteSeerX 10.1.1.695.2737. doi:10.1016/j.actaastro.2011.11.006. ISSN 0094-5765. ^ Lloyd, S. (2000). "Ultimate Physical Limits to Computation". Nature. 406 (6799): 1047–1054. arXiv:quant-ph/9908043. Bibcode:2000Natur.406.1047L. doi:10.1038/35023282. PMID 10984064. ^ Kurzweil, R. (2005). The Singularity Is Near: When Humans Transcend Biology. Penguin Books. p. 362. ^ Ćirković, Milan M. (2008). "Against the Empire". Journal of the British Interplanetary Society. 61 (7): 246–254. arXiv:0805.1821. Bibcode:2008JBIS...61..246C. ISSN 0007-084X. ^ Webb, Stephen (2015). If the Universe Is Teeming with Aliens ... Where Is Everybody?. Science and Fiction. Cham: Springer International Publishing. pp. 203–206. ISBN 978-3-319-13235-8. ^ Webb, Stephen (2015). If the Universe Is Teeming with Aliens ... Where Is Everybody?. Science and Fiction. Cham: Springer International Publishing. pp. 196–200. ISBN 978-3-319-13235-8. ^ Vidal, C. (2016). "Stellivore extraterrestrials? Binary stars as living systems". Acta Astronautica. 128: 251–256. Bibcode:2016AcAau.128..251V. doi:10.1016/j.actaastro.2016.06.038. ISSN 0094-5765. ^ "Evo Devo Universe Community". Retrieved 2018-04-25. ^ Smolin, Lee (1992). "Did the universe evolve?". Classical and Quantum Gravity. 9 (1): 173–191. Bibcode:1992CQGra...9..173S. doi:10.1088/0264-9381/9/1/016. ^ Crane, Louis (2010). "Possible Implications of the Quantum Theory of Gravity: An Introduction to the Meduso-Anthropic Principle". Foundations of Science. 15 (4): 369–373. arXiv:hep-th/9402104. doi:10.1007/s10699-010-9182-y. ISSN 1233-1821. ^ Harrison, E. R. (1995). "The Natural Selection of Universes Containing Intelligent Life". Quarterly Journal of the Royal Astronomical Society. 36 (3): 193–203. Bibcode:1995QJRAS..36..193H. ^ Gardner, J. N. (2000). "The Selfish Biocosm: complexity as cosmology". Complexity. 5 (3): 34–45. Bibcode:2000Cmplx...5c..34G. doi:10.1002/(sici)1099-0526(200001/02)5:3<34::aid-cplx7>3.0.co;2-8. ^ Vidal, C. (2014). The Beginning and the End: The Meaning of Life in a Cosmological Perspective (Submitted manuscript). The Frontiers Collection. New York: Springer. arXiv:1301.1648. Bibcode:2013PhDT.........2V. doi:10.1007/978-3-319-05062-1. ISBN 978-3-319-05061-4. ^ a b Korotayev A. The 21st Century Singularity and its Big History Implications: A re-analysis. Journal of Big History 2/3 (2018): 71 - 118. ^ Korotayev A., Malkov A., Khaltourina D. Introduction to Social Macrodynamics: Secular Cycles and Millennial Trends. Moscow: URSS, 2006. Heylighen, Francis (2007). "Accelerating Socio-Technological Evolution: from ephemeralization and stigmergy to the global brain" (PDF). In Modelski, G.; Devezas, T.; Thompson, W. (eds.). Globalization as an Evolutionary Process: Modeling Global Change. London: Routledge. ISBN 978-0-415-77361-4. Accelerating Change, TechCast Article Series, Al Leedahl. Is History Converging? Again? by Juergen Schmidhuber: singularity predictions as a side-effect of memory compression?